An important aspect of any business dealing with products and inventory is to periodically compare system inventory records against the actual physical stock in the stores and the warehouse locations. In Finance and Operations, one way to reconcile inventory is to use Inventory Counting Journal. This journal is able to calculate the on-hand (system) inventory of the items automatically and expects the users to count the physical inventory manually and update the journal lines. Su_Counting – is used to store the count data in the App where as all other custom entities are used to store key data from Finance and Operations. The below image shows the item barcode scanning and counting process using a the app. Import the app to explore the complete App capabilities. Download the Count Assistant PowerApps application to your local machine. 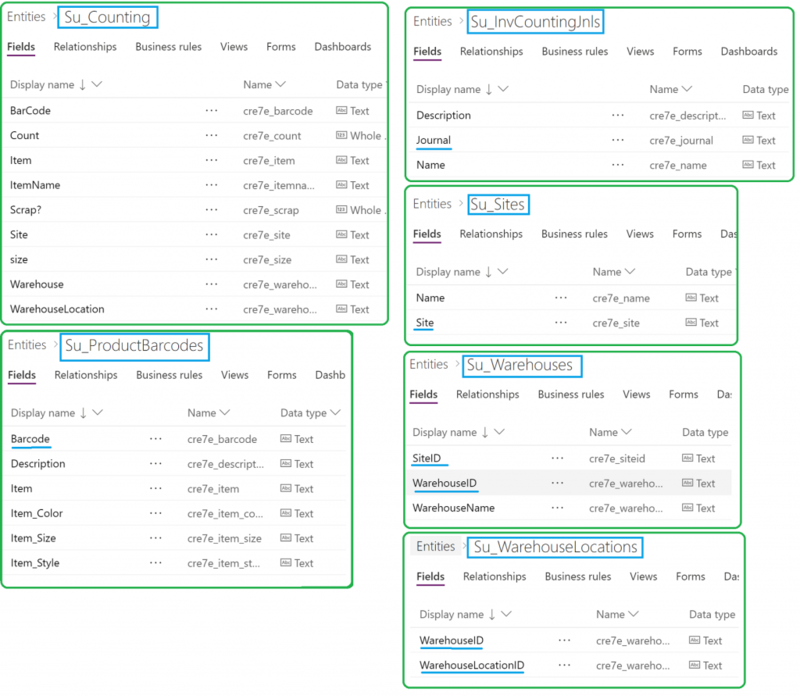 This app connects to the custom CDS entities created in the previous step and Inventory counting journal lines entity in Dynamics 365 for Finance and Operations instance. Import the app into your PowerApps instance. Make sure all the connections are pointing to the right data source (CDS custom entities and Inventory counting journal Lines entity in Finance and Operations) and there are no errors. Download the PowerApps application on your camera enabled mobile phone/tablet device and login to find the Count Assistant app . This application was created to show the capability of PowerApps and how it can work with Finance and Operations only. This is not an official application from Microsoft. This application can be customized to suit your business needs including the data sources used in this app.